Erin Miller | Galion Inquirer The Galion Tigers had themselves an offensive explosion on Saturday during a non-conference doubleheader with the Seneca East Tigers. In the two games, Galion put up a total of 30 runs and Mitch Dyer, pictured sliding into home, scored two of them. Erin Miller | Galion Inquirer Galion's Ryan Utz picked up the win in game number one of a Saturday doubleheader with Seneca East. The Tigers move to 3-0 early in the season after the sweep over the non-conference visitors. Erin Miller | Galion Inquirer Tigers catcher Aaron Barnhart looks into the dugout to get the signals from the Galion baseball coaching staff. Barnhart had two, mult-hit games on Saturday as the Galion Tigers swept the Seneca East Tigers in their non-conference doubleheader. 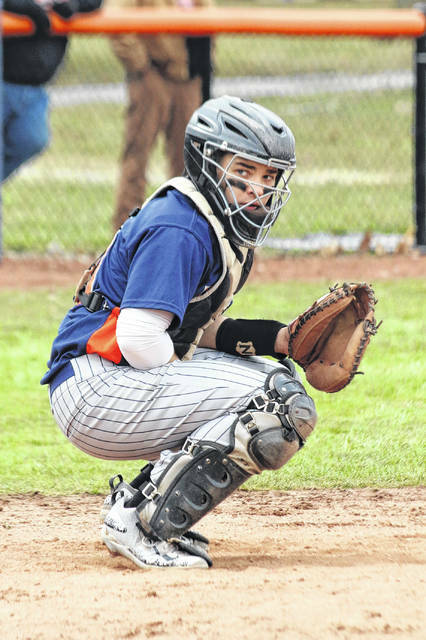 Erin Miller | Galion Inquirer Cameron Payne is off and running during Galion's home doubleheader of Saturday. Payne finished 4/6 at the plate, recording a pair of singles and a pair of doubles while driving in four runs and scoring three across the two games as the Tigers swept Seneca East. 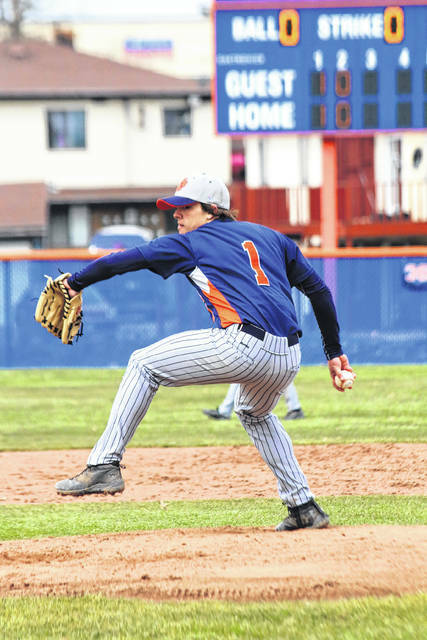 GALION — The weather has been far from ideal to begin the 2018 high school spring sports season but the Galion Tigers baseball squad was able to squeeze in a non-conference doubleheader on Saturday, March 31 against the visiting Seneca East Tigers of the Northern-10 Athletic Conference. In the first game of the double dip, it was the Tigers of Seneca East getting on the scoreboard early but it would be the Galion Tigers pulling away with the win thanks to a 13-run, bottom of the fifth inning; 16-6. Entering the eventual final inning, the hometown Tigers found themselves trailing Seneca East by a tally of 6-3. That is when it all fell apart for the visitors as Galion’s bats came alive, running the starting pitcher out of the game before tacking on 10 additional runs on the relievers to secure win number two of the season. Ryan Utz picked up the win on the mound for Galion, going 4.1 innings, allowing just three hits and six runs (four earned) while walking seven and fanning seven. Clay Karnes pitched the final 0.2 innings, walking just one batter and allowing no hits or runs on just six pitches. Utz helped his cause with a single, two runs batted in and three runs scored on the day. Karnes also recorded a single and scored twice for Galion. Aaron Barnhart, Cameron Payne and Carter Keinath finished the first game of the day with multiple hits. Barnhart had a single and a double while driving in three and scoring twice. Payne and Keinath reciprocated that, recording a single and a double apiece with Payne netting three RBI and scoring twice and Keinath plating two and scoring once. Other hits came off the bat of Ethan Pigg (triple) and Mitch Dyer (single). Pigg also drove in a run and scored twice and Dyer plated one and scored twice as well. Spencer Keller and Kaleb Harsh each scored a run to round out the Galion offense in the first game. Overall, the hometown Tigers scored their 16 runs on 10 hits, recorded four errors in the field and left just two runners on base. Seneca East had just the three hits en route to the six runs, committed six errors and left six on the base path. Game number two in the battle of the Tigers also went in favor of Galion as they marched to a seven-run victory; 14-7. The win propels Galion to a perfect 3-0 on the season as Seneca East drops to 1-2. Galion earned their 14 runs on 10 hits, committed five errors in the field and left nine runners stranded. The visiting Tigers scored their seven runs thanks to seven hits, recorded three errors and stranded seven. Keinath came on in relief for Payne and went four innings after Payne through the first three. Keinath surrendered just three hits, two runs (one earned), struck out four and walked two. Payne, the starter, gave up four hits, five runs (three earned), walked just one and recorded six K’s. At the dish, Cameron belted a single and a double, drove in a run and scored a run while also stealing a base. Carter finished with a single and a run scored at the plate in the win. Barnhart finished game two with multiple hits, giving him four on the day after recording a pair of singles, plating two and scoring a run himself. Utz, Pigg, Dyer, Keller and Karnes rounded out the hits for Galion, all singles with the exception of Karnes’ double. Utz scored three runs, drove in two and swiped two bases in the second game. Pigg would also score three times, plate two and record one stolen base. Dyer netted a pair of RBI, Keller scored two runs and Karnes plated two and scored once. 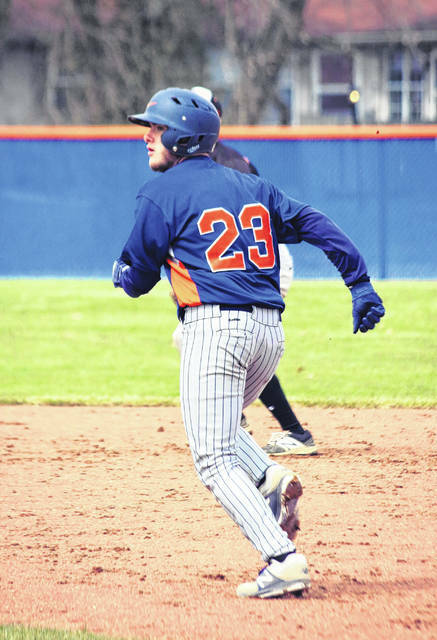 Harsh and Logan Cook scored the other two runs to conclude Galion’s offensive explosion over the weekend. The Galion Tigers will head to Bucyrus to clash with another N-10 team in the Redmen on Monday, April 2. On Tuesday and Wednesday, the Tigers will hope to get in a pair of league games, both against the River Valley Vikings. Tuesday’s game is scheduled to be played in Galion with the Tigers traveling to Caledonia on Wednesday. The Galion Tigers had themselves an offensive explosion on Saturday during a non-conference doubleheader with the Seneca East Tigers. 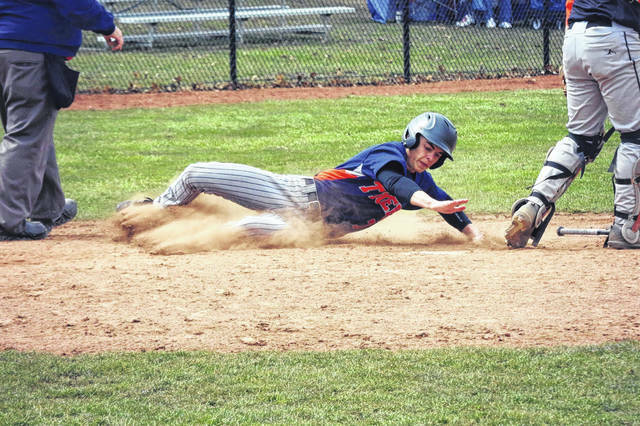 In the two games, Galion put up a total of 30 runs and Mitch Dyer, pictured sliding into home, scored two of them. Galion’s Ryan Utz picked up the win in game number one of a Saturday doubleheader with Seneca East. The Tigers move to 3-0 early in the season after the sweep over the non-conference visitors. Tigers catcher Aaron Barnhart looks into the dugout to get the signals from the Galion baseball coaching staff. Barnhart had two, mult-hit games on Saturday as the Galion Tigers swept the Seneca East Tigers in their non-conference doubleheader. Cameron Payne is off and running during Galion’s home doubleheader of Saturday. Payne finished 4/6 at the plate, recording a pair of singles and a pair of doubles while driving in four runs and scoring three across the two games as the Tigers swept Seneca East.